Jessica I can relate... I have two Honey suckle bushes and while I love the scent of them... I don't love the back breaking chore of cutting and pulling them free from the other bushes that they have taken over! Yeah... they are a beautiful nightmare! Hey by the way Thanks for stopping by my blog and leaving your comment on My post..Were do birds go at night? 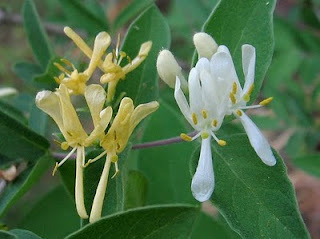 I was looking at all the honeysuckle vine in our wooded areas in Greenwood. I am going to have a lot of pulling and clearing of that stuff. This is how I feel about Morning glory. I am on a vendetta against the wicked vine! It is a daily battle, but we will persevere! It is a terrible invasive plant. Deer eat them, the only good pairing of deer and plants that I know of. Hi Jessica, I hope the pulling of Honeysuckle won't eat up all your time, although those are quite stubborn vines. Maybe they're probably at the wrong place? There are no Honeysuckle in our garden yet, but our neighbor just saw a bobcat! In my central Florida yard, passionflower causes the same problems you are having with your honeysuckle. I've been trying to eradicate it for 3 years now. I hope you have more success getting rid of your vine than I've had with mine. As they say, "A weed is a plant in the wrong place."